Just like your pup, pineapples are sweet on the inside (and maybe just a tad rough on the outside)! 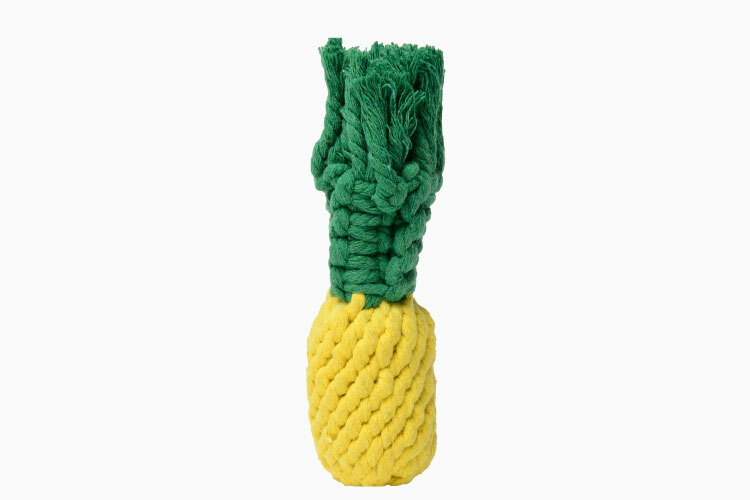 Our new pineapple shaped rope chew toy, is here just in time for Spring. While pineapples are rough and tough on the outside (and not really recommended for dogs) this puppy is surely not! This pineapple shaped chew toy is made from sturdy rope that helps keep your dog’s teeth and gums clean. These are just perfect for teething pups. This 7 x 3 toy, will keep your pup happy and entertained all season long! Summertime hack: Thoroughly wet the toy and then freeze for a puppy play pineapple (unfortunately not flavored) popsicle! We don’t recommend saying that three times fast 🙂 No excuses to not make this sweet rope toy your hot dogs new favorite toy all year round. We love seeing customer photos! Send us a picture of your pup with his new waggo items or tag us on Instagram to be featured on our page! Do you feel like your pups toy count is getting out of control? Check out our newest dipper toy bins to control all of your favorite impulse buys. Previous post:Nice to Mat You, Pop Plush Mat “Lambskin” Dog Bed!